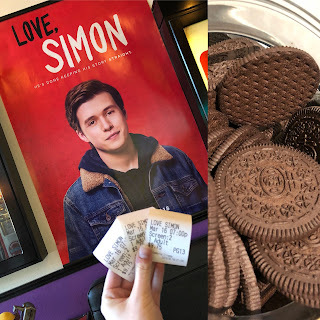 Love, Simon got me out of the house and into a movie seat with a bucket of popcorn on my lap, something not high up on my list of favorites. I'm a firm believer in waiting till a movie comes on iTunes to watch it, but I couldn't resist the opening night showing. I'm glad I went. Based on the book and the commercials, I was pretty confident I was going to love the movie. Though movie adaptions have a tendency to disappoint, Love, Simon keeps it together with a stellar cast and a script that understands the importance of respecting the source material. The movie blends seamlessly with the book, giving readers a fulfilling visual experience. The casting, though is Simon's secret sauce. Nick Robinson embodies Simon perfectly. He's charismatic and hilarious while also portraying the inner struggles that make up so much of Simon vs. The Homosapien's Agenda perfectly. But, while I had expected to love Robinson's performance, Abby, portrayed by Alexandra Shipp, made the movie for me. While I liked Abby's bright, outgoing personality in the book, Shipp brought her to a new level. She shined bright on the screen. Love, Simon is the perfect new edition the decades worth of notable high school movies, but it also holds a special place. Many of these classic movies it stands beside are tinged with homophobia and racism. I love that Simon can mark a turning point with the genre with its diverse cast and a story about a gay teen getting to succeed in the end. It was evident that everyone in the almost exclusively teenage audience loved it by the clapping and cheering at the end. And that is special because Love, Simon really feels like the movie made for my generation, exploring what high school is like now. But I also think that it's important that everyone go see this movie because Love, Simon has a real opportunity to build empathy while we laugh, cry, swoon, and cheer with Simon as he takes his stab at navigating this crazy world we live in.